I do love brownies. 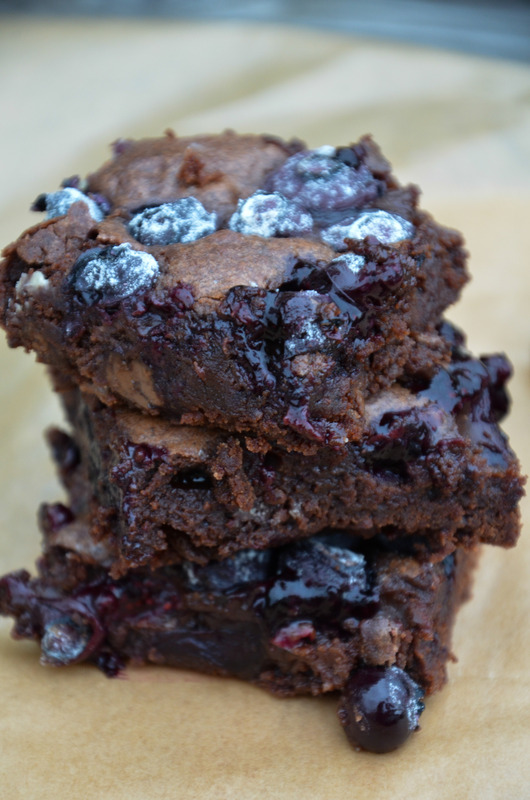 I may not be the biggest super fan of chocolate, but I will probably always say ‘yes’ to a good brownie. Especially the gooey-inside // flaky-outside variety. How could you say no to that? Then there’s the addition of rosewater chocolate frosting (optional, but tasty) based on a recipe from the Kitchn, and chopped pistachios and rose petals for decoration (again, optional, but also tasty) which essentially makes these brownies into a rather fancy dessert . 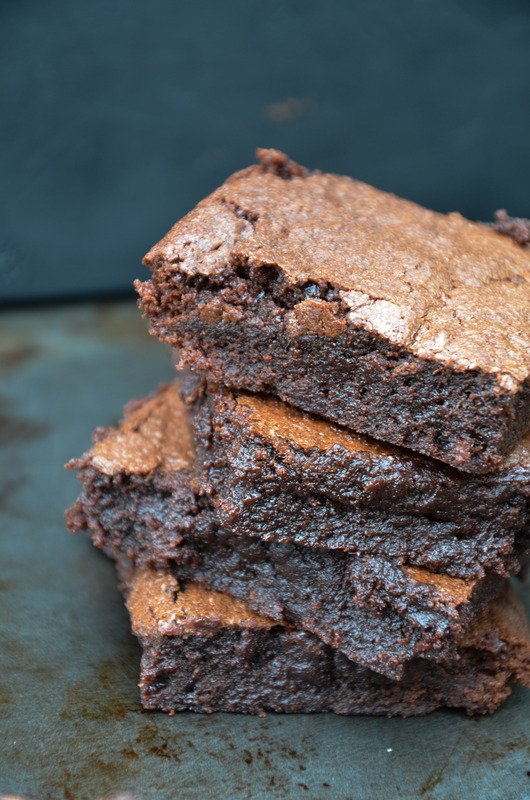 This brownie recipe comes from an adaptation of Iambaker’s recipe that mimics that of a boxed brownie mix (you can find the recipe here). 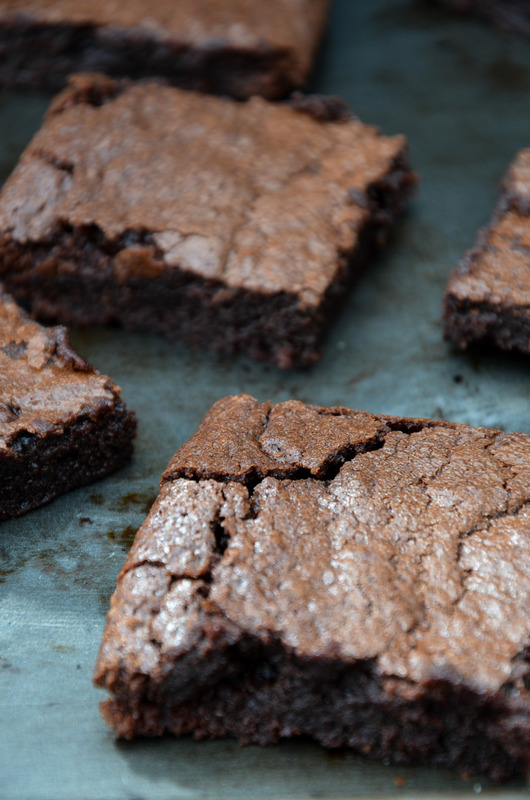 It uses cocoa powder, rather than chocolate, but that doesn’t mean dry brownies. In fact, this is probably where oven temperatures and how long you bake the brownies have more impact on making dry brownies than the cocoa powder. Therefore, in this instance, it’s probably better (and tastier!) 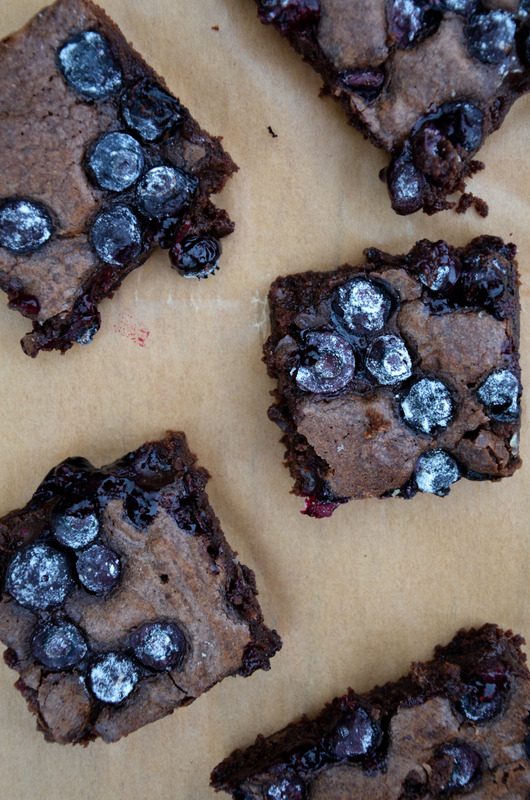 to be on the side of under-baking your brownies than over-baking brownies, because dry brownies are also sad brownies. Not even frosting can totally make up for sad brownies. I gotta say, this has been a long time coming. 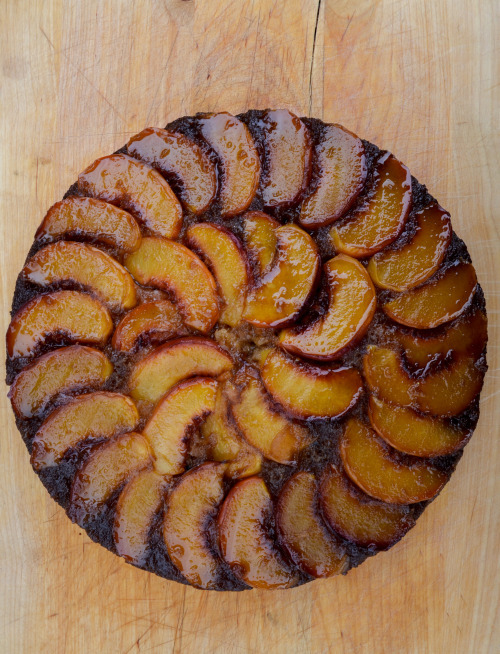 Tarte tatin, and all things sweet that happen to be upside down and full of sticky, caramel-y goodness, has been on the list for SO long, even since I was a little girl. Upside-down tarts and cakes were some of my childhood favourites, and I would always beg my mother to make one for me, and she’d usually distract me with words of how difficult it was and the promise that I could get a bought one from a bakery instead (and she did hold to the latter one usually). But there’s always something fun about managing to make your own! Yet, on the other hand, that caramel was always going to be a problem…burning sugar has always been something that came with a strong warning in our kitchen when I grew up (with good reason, of course). 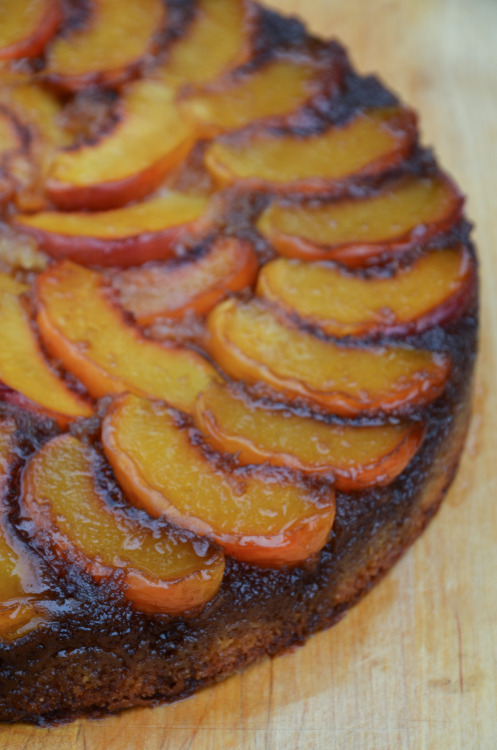 Perhaps I’ll graduate to a more traditional type of upside-down cake/tart, but for now, this one serves its purpose. And a great one at that. 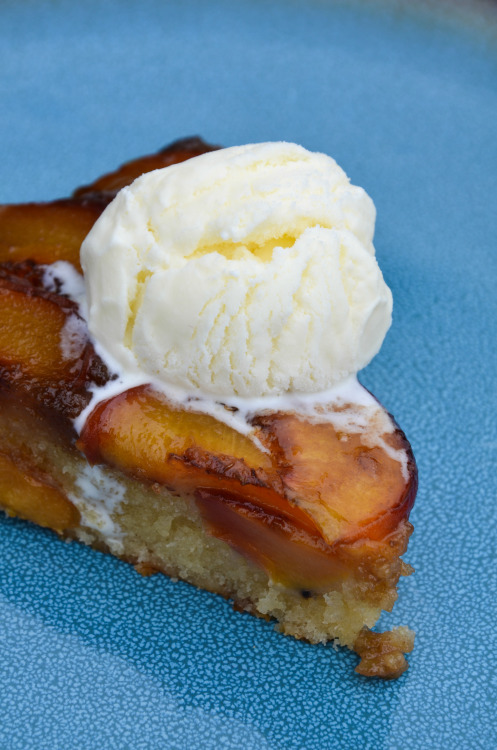 This cake is sticky and gooey and sweet with the peaches and brown-sugar butter that cooks itself in the oven (no burnt hands here! ), and the actual cake itself rich and spiced with cinnamon and cardamom, both of which lend another layer of warmth for a dessert that seems both perfect for warming up a cold autumn’s evening, or topped with ice-cream for the end of a summer BBQ. I guess the TL;DR version of it is that it’s just plain great. So I’m not just on a baking spree, but also a brownie/chocolate-themed baking spree, which is exciting for me — not really because of the chocolate part, (I’m not one of those people who’d go crazy for a piece of chocolate — I could probably forget its existence if I had the chance…!) but because my history of baking chocolate-y things is not so great. Or at least the results weren’t. Unless it came from a boxed brownie mix, the results were never much to shout about. This is sort of-maybe-just kind of cheating, since this is at once both a brownie, but also very close to a Swedish favourite of mine; kladdkaka, which, if done correctly to my judgement, is like a giant cake version of the most gooey, wonderfully unbaked brownie, usually dusted with icing sugar and served with whipped cream. I just mentioned that I’m not a chocolate person, and I stand by that, but even childhood me (who was a lot less tolerant of chocolate than I am now, in fact) would sell a piece of her soul for kladdkaka, especially the fresh-out-the-oven, homemade version. So this, combined with the fresh bursts of blueberry flavour, is like a dream. 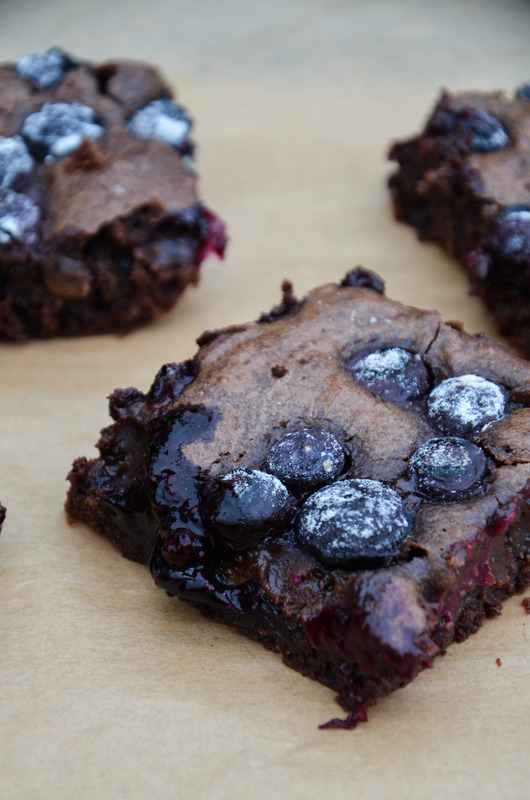 Note; to make sure the blueberries don’t sink to the bottom of the batter whilst baking, I coat the blueberries in 1tsp of flour and 1tsp of icing sugar (see the recipe for more details). Don’t worry about the flour, because after baking, you couldn’t tell that there was any flour (or icing sugar, for that matter!) around them in the first place! So, we need to talk about salted butter for a moment. I’m sure most of us know that the large majority of recipes call for unsalted butter,so that you can then control the salt in your baked goods, but in this case, the saltiness is a perfect addition to the richness of an otherwise classic brownie recipe, and adding the mint as last minute idea totally worked out in my favour, since it too works well with the chocolatey-fudgey taste. I don’t mean to brag, but I think I’m becoming a pro at this shortbread thing. A baking thing, no less — exciting times (for me)! 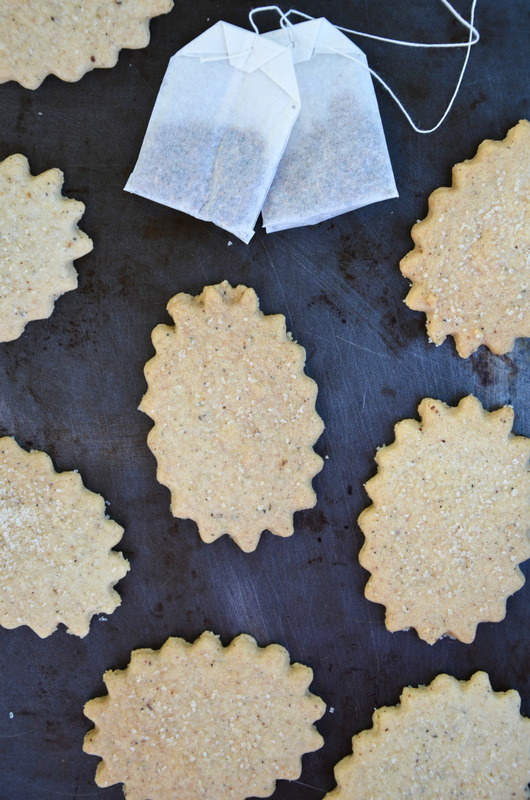 I always like to add a little twist on simple shortbread, so this time, I wanted to add a tea flavour, after seeing a few baking recipes adding green tea, chamomile, and early grey flavours and that just got me inspired. I was a little limited by what I actually owned, however. I was still in the process of unpacking all my things from university, including some of the kitchen stuff (such as my tea boxes! ), and settled on chai. I’m not a huge fan of chai, in fact, since I prefer the flavour in a latte, but I had a few tea bag samples from our local health store, so what better way to use them up? They’re perfect for a cup of tea (! ), or a cup of coffee, or just when you fancy something sweet, but not too sweet (if you get me). I suppose these are technically biscuits in the UK sense, so I’m sort of going with both! Cookies, biscuits, whatever — they’re good. And don’t let the variety of flavours here put you off, since the rosewater and cardamom add a soft fragrant taste that works well beneath the nuttiness of the pistachio and dark chocolate dip. 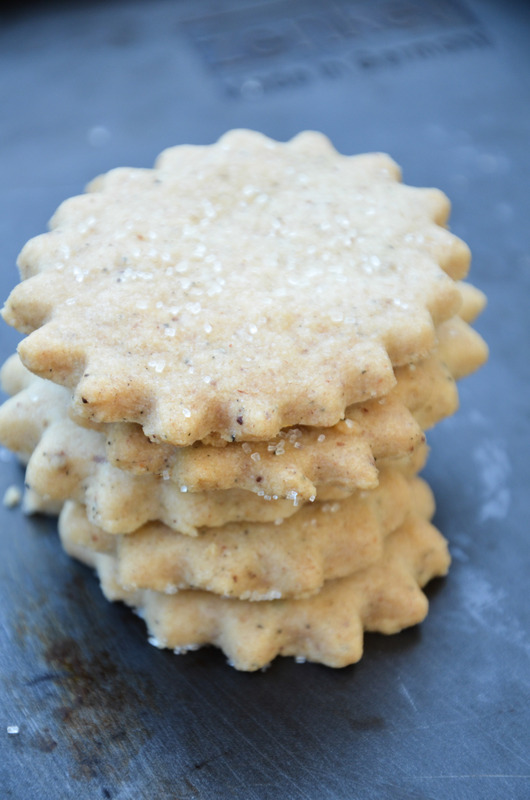 The shortbread-biscuit base is a great canvas for all these flavours. I’ve mentioned previously that I’m not the biggest chocolate fan ever, but I *do* like it combined with over ingredients, such as tart berries, or pistachios, or combining it with some white chocolate to add that sweetness that I think I miss with milk/dark chocolate. I’m just clearly not a fan of cocoa! On top of everything of course, I think they’re pretty. And I love pretty things that taste nice too. So it’s obviously just an all-rounder!